The gemmy quality of this miniature is surprising, both for its transparency and its esthetic color. We also note the definition of faces and edges of the prismatic crystal. A doubly terminated floater crystal, completely transparent, bright, slightly yellowish. Both terminations are excellent. A novelty in Munich 2010. 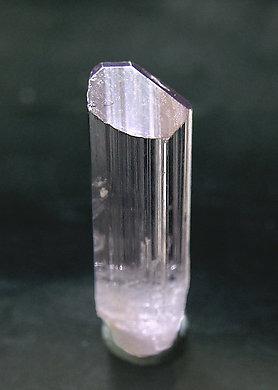 A doubly terminated single crystal with very uniform transparency and color, pale yellow, showing fine vertical striations and an excellent termination with slightly curved faces and edges.